Brand Leadership was established in 2002 as Africa's first firm to offer brand strategy, brand valuation and intellectual property management as a core integrated service for decision makers who want to build sustainable brands in Africa. Brand Leadership has a refreshingly unique approach - Africa Inside™ - which inspires and enables us to develop world–class brand and business solutions grounded on deep African insight. Brand Development (research, strategy and design), Brand Activation (creative (advertising and BTL), media, public relations, events and digital) and Brand Management (brand valuation, intellectual property management and brand training and engagement). 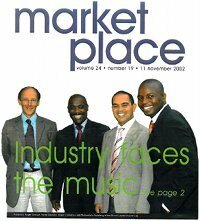 Organisation 1 October 2002, Brand Leadership established focusing on brand strategy, brand valuation and intellectual property management. Key Projects First client, End-2-End, an office automation and consumables company. 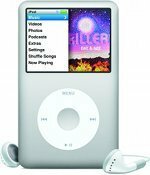 First global brand client, Apple IPOD, launch in SA. Appointed by Government of South Africa to consolidate and define branding rules for the government brand, the national Coat of Arms. Develop Standard Bank Group’s group-wide sponsorship strategy. 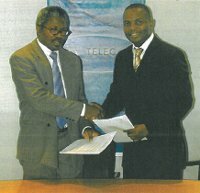 First non-South African client, Telekom Namibia. 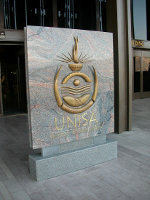 Re-brand merger of UNISA, Technikon SA and VISTA to UNISA, world’s 10th largest mega-university. Brand positioning, identity refinement and brand standards manual for South African Revenue Service (SARS). Development of brand positioning, merchandising and branding guidelines for Gautrain, Africa’s first rapid rail link. 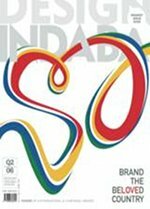 Thought Leadership Brand Leadership presents a seminal perspective initiated by Design INDABA, on presenting a uniform nation brand for South Africa. 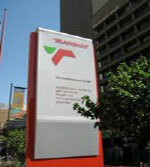 Re-Brand of Transnet, the continent’s largest public freight and logistics company. Brand positioning and identity evolution of South Africa’s biggest information and document management company, Metrofile. Brand Leadership launches “State of Marketing in South Africa” Survey in partnership with Ipsos Markinor. Organisation Brand Leadership wins Finance Week's "Marketing Services Company of the Year"
Key Projects Lead’s Ghana's NDC party repositioning and brand campaign to win presidency by 0.3%. Thought Leadership Brand Leadership founder Ikalafeng presents a paper on African Leadership & Impact on Brand Africa at Belbin Conference at Cambridge University, UK. Launch Brand Leadership Academy, brand-driven, customer-centric insights and leadership development initiative. Launch IHOP, Brand Leadership subsidiary for experiential media, content and activation. Re-Brand SARCC, public rail agency of South Africa to to PRASA. Ihop develops and launch MTN’s 2010 FIFA World Cup South Africa experiential zones around key world cup city airports. Thought Leadership Brand Leadership Academy launches Public Sector Excellence initiative. Organisation Brand Leadership joins World Wide Partners, the world’s 10th largest marketing communications network. Develop and implement Brand SA engagement and training programme to build SA internal brand ambassadors. Ihop launches mobile media – JIATA Taxi Media with Brand SA as first client. Brand Leadership founder, Ikalafeng, presents "African Magic" at Icograda (International Council on Graphic Design Associations), Madrid, Spain. 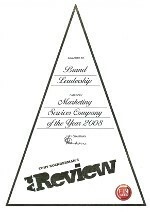 Organisation Brand Leadership wins 2011 REBRAND 100 Global Awards for effective brand transformations for PRASA, ubank and SA Express. Launch of Brand Africa’s top 100 African brands. Brand Leadership Academy launches third successive public sector excellence awards. Brand Leadership Group produced a branded gathering of 2000 Africans at the 2012 African Green Revolution Forum in Tanzania. Brand Leadership Group developed a second successful re-election branding campaign for National Democratic Congress, Ghana. Organisation Brand Leadership awarded a Distinction by REBRAND in New York for the re-branding of Meat Junction in 2013. 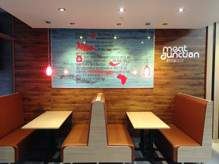 Brand Leadership re-brands the first meat based African-inspired fast-food brand, Meat Junction to prepare it for re-launch as a national franchise. 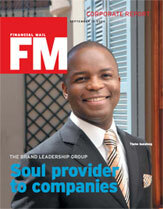 Brand Africa 100 is cover story for African Business. Brand Leadership's Ikalafeng named one of 100 Most Influential Africans by New African Magazine. are registered trademarks of Brand Leadership (Pty) Ltd and/or Ikalafeng & Associates.